A delightful show of snow-white berries. Glistening, snow-white berries in your garden at Christmas. Delicate pink flowers each summer. Very easy to grow and completely winter hardy. Supplied as an established plant in a 3L pot. Just imagine, glistening, snow-white berries in your garden at Christmas - looking like tiny, sparkling decorations. Callicarpa, also known as the Beauty Berry, is a fabulously decorative shrub, characterized by bunches of berries which brighten the autumn garden with a sparkling hue. Something a little different to the usually seen purple plant - 'Magical Snowstar' is covered in snow-white berries from October to November which contrast beautifully with the autumn colour changes of its leaves. Callicarpa also works well as a decorative addition to Christmas displays, and adds a touch of winter magic to flower arrangements in your home. Growing to around 2.5m (8ft) Callicarpa bodinieri 'Magical Snowstar' is a tightly branching shrub which colours up in the autumn, when the leaves turn yellow before they fall, revealing the perfect snowball berries. If you're keen to cut the stems for indoor displays, then it's best to wait until December for the best colour. If you're keen to incorporate white accents into your garden, then callicarpa is an ideal choice. 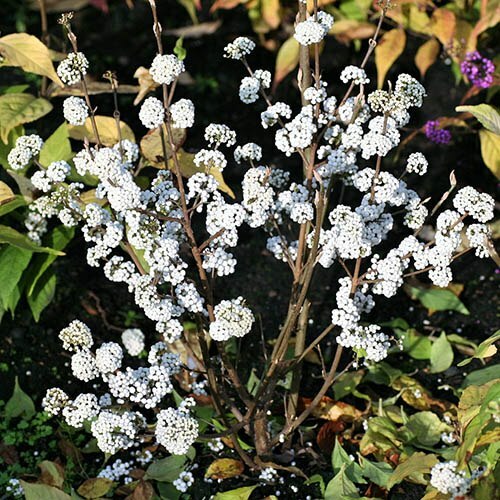 With a high tolerance for most soil types, it's very easy to grow - Magical Snowstar needs very little in the way of maintenance, just plant it in partial shade and prune out any dead or damaged branches in the spring. The bright berries provide your home with a colourful accent - although wait until the berries are fully grown and have their full colour. Once in a vase, it is important that they are in a cool and not too sunny place to retain the best colour. They're long lasting too, keeping for more than a month once cut as long as you don't drown the stems – they're fine in just 4in of water with a drop of bleach in the vase. You will receive an established plant in a 3L pot, ready for planting out. When planting, add plenty of well-rotted organic matter into the planting hole. Plants benefit from the addition of mycorrhizal fungi to the planting hole. Prune back stems in early spring if necessary to remove spindly or damaged growth, cutting back to a permanent framework. Grow Callicarpa in any fertile, well drained garden soil in full sun or partial shade.